The trend towards creating beautiful and functional bathrooms through the use of furniture-like bathroom vanities is continuing, according to interior design professionals. "It's standard that vanities look like pieces of furniture," Houston-based interior designer Donna Vining told Kohler.com. "It's been that way in Europe forever. It just took some time for the trend to hit the States." No matter what their personal style is, experts say that homeowners are increasingly choosing these freestanding vanities for bathroom remodel projects and new construction. These pieces help many create a refuge from their busy, hectic lives and also help them make larger bathroom spaces unique and efficient. "The furniture look is most definitely appropriate for these [larger] bathrooms," a spokesperson for the American Society of Interior Designers, Deborah Burnett, told Kohler.com. "I see armoires, upholstered chairs and vanities that are true pieces of furniture rather than built-in cabinetry." While there is no shortage of stunning bathroom vanities with furniture-like styling to choose from, some manufacturers are now offering homeowners the option to custom design theirs. 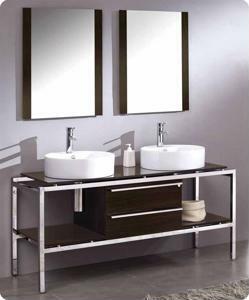 ForResidentialPros.com reports that Dura Supreme has released a line of freestanding vanities that can be configured in a variety of ways and are available in different woods, finishes and styles to match any desired look.